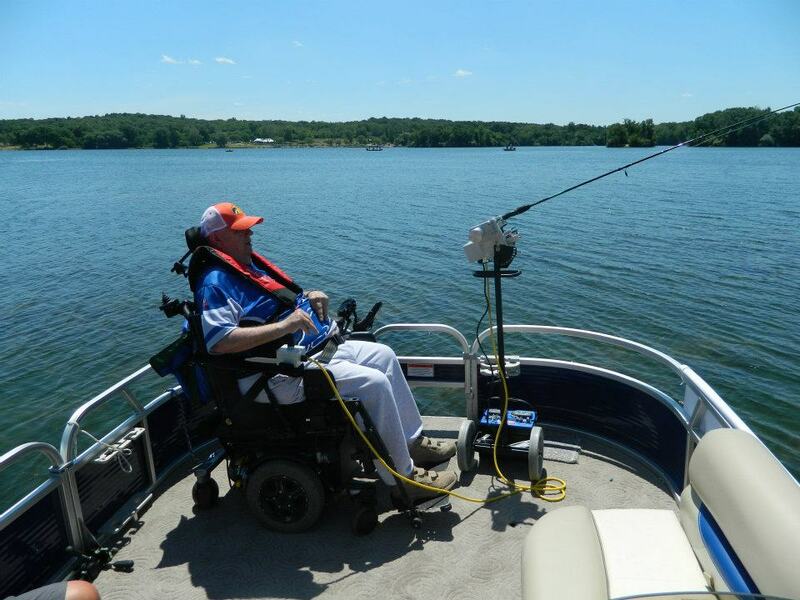 Outpatient client Carroll P. thought his fishing days were over after he sustained a spinal cord injury in 2008, but all that changed with some help from the "Fishing Doc." The Fishing Doc is a cool new adaptive fishing pole that Carroll recently tried out at a charity fishing tournament put on by bass pro Kevin Vandam and the Detroit Lions. Michigan Out of Doors TV, which airs on WTVS-TV, was at the event and filmed Carroll using the fishing pole which he maneuvered through the joy stick on his power chair. The event brought out some of the world’s greatest bass pros to fish alongside Lions players and sponsors at Kensington Metropark on June 12th. Back row (left to right): Mike Ball, Vice President of Harbor Light Health, Lions Head Football Coach Jim Schwartz and Matt Gelso, Presidet of Harbor Light Health; Front row (right): Special Tree client Carroll P.